Did you know that 100% of the proceeds to Scentsy's Charitable Buddy, Sasha go straight to the Ronald McDonald House Charities®? That's right. With Scentsy having over 200,000 active consultants, if each one of us purchased a Sasha Buddy, Scentsy would raise at least $500,000 to donate to them! WOW! Even better, if customers joined in on this donation. 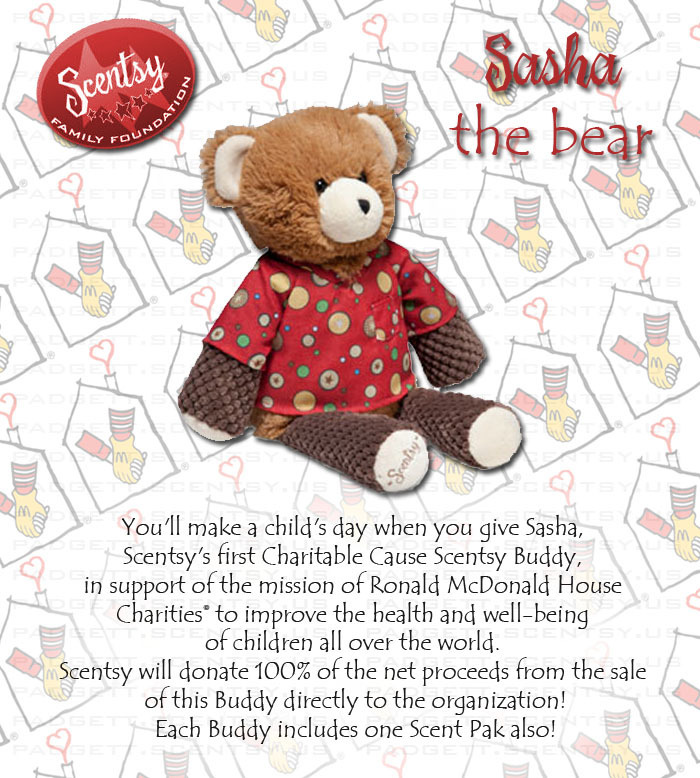 Scentsy has asked us consultants to ALL purchase just one Sasha Buddy and those of us attending this years convention, to bring that Buddy and donate the bear to charity (on top of the money that Scentsy will be raising from its sales). So please join us thousands of consultants and other Scentsy fans in purchasing just one Sasha Buddy. If you don't have any need for a good smelling stuffed animal, gift it to a friend or family member. If you still have no need for that, please take the time to donate the animal to a local charity or even pass it along to the first kiddo you see while you're out in public. This can be our fun Scentsy smelling version of Pay It Forward. Did I mention that this isn't just any stuffed animal? Nope! Sasha comes with your choice of one of 40 different Scent Pak's to be included with her. Its a small scent pouch that you place in her belly and you'll have an awesome smelling stuffed animal for months to come. Wanna see this totally cute snuggly bear? Here you go! Click any of the links above to go directly to the Sasha Buddy ordering page of my website and start helping today! Your support is greatly appreciated! It's time to Pay It Forward! This is a cute way to give! I need your voting help please! The Do It Yourself Lady - Giveaway! Tis the season to spread germs! Day 13 Challenge Giveaway Winner Announced!